Ain’t no party like a Penn Relays party. Except maybe a Drake Relays party. 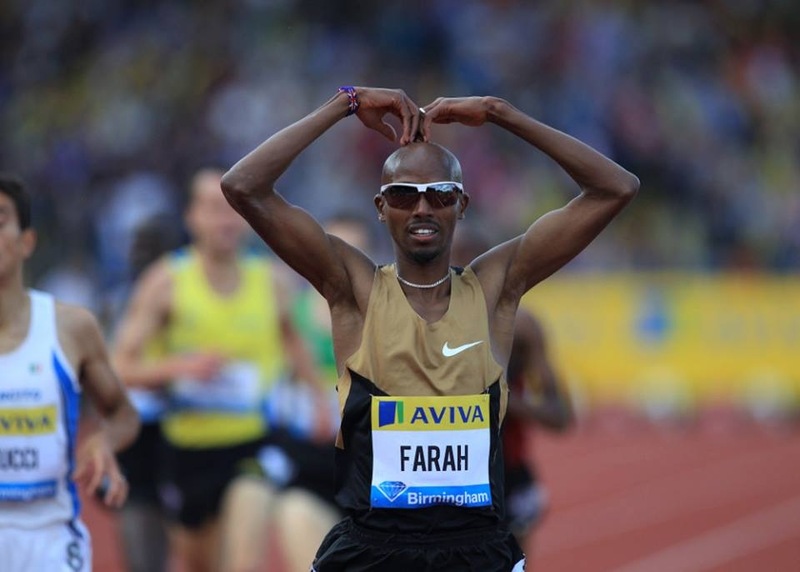 Today the Drake Relays and Penn Relays reach their climax with four and a half hours of live television coverage, and tomorrow morning is the London Marathon. The Penn Relays will be broadcast live on NBC Sports Network from 12:30pm to 3:00pm (Eastern time). The broadcast will then switch over to the Drake Relays from 3:00pm to 5:00pm, also on NBC Sports Network. In addition, the remainder of these meets will be available via webcast, so you can create your own NFL Red Zone-type whiparound coverage. 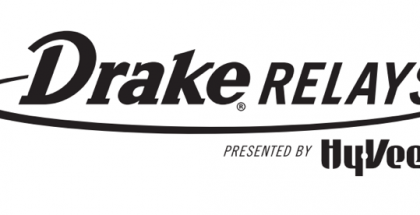 The Drake Relays will be available on USATF.tv (free) from 1:30pm to 3:00pm and available at True Blue TV (subscription required) for the rest of the day. The Penn Relays is available at Flotrack (subscription required). 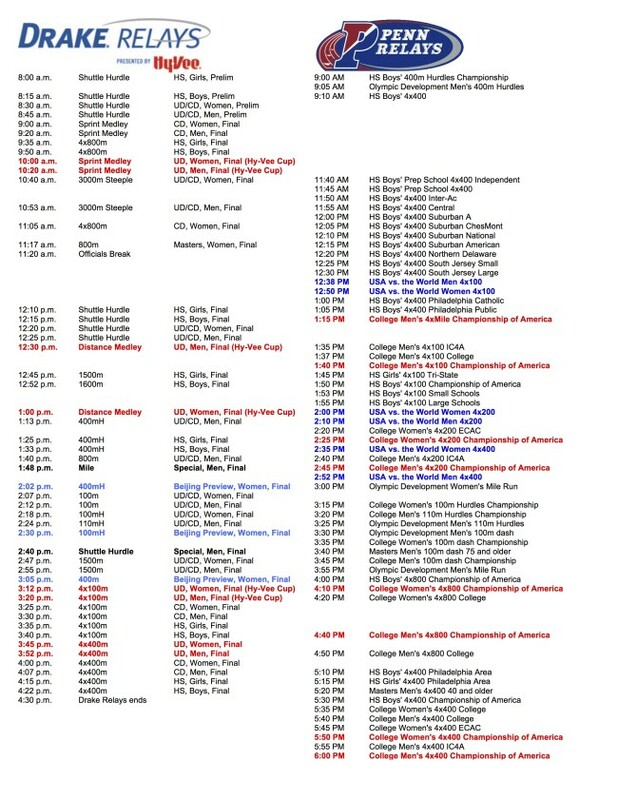 Here’s a handy combined schedule (PDF version) to help you direct your attention between the two meets. Tomorrow morning’s London Marathon will be available live from 4:00am ET at UniversalSports.com and tape-delayed from 9:00am ET at Universal Sports TV. Drake Relays results | Des Moines Register Drake Relays News | IAAF: Kirani James Flies To 44.22 At The Drake Relays! The Penn Relays and Drake Relays are gigantic carnivals of track and field. The last Friday and Saturday in April are to track and field as the first round of March Madness is to college basketball or New Year’s Day is to college football. Today is an all-day celebration of track and field, so make a party out of it. Both meets have very good live results websites, complete with start lists. Drake’s has live field event updates, while Penn’s includes event previews. The headline action is the USA vs The World races at the Penn Relays. The series has only sprint races this year (4×100, 4×200, 4×400)—next week’s World Relays has stolen a bit of Penn’s thunder—but the races will still have the US/Jamaica rivalries. And maybe the US teams will find totally new and more entertaining ways to make mistakes. I mean, who can forget the men’s 4×400 from last year? For my money, the best things to watch are the college relays. Penn has its Championship of America races and Drake has its Hy-Vee Cup races, where athletes will go to the edge and beyond for nothing more than the honor of their university and the love of their teammates. Top races today include the Penn men’s 4 x mile (1:15pm ET) and women’s 4 x 800 (4:10pm ET). High schoolers will get their moment in the sun as well. Penn’s Championship of America races take an expansive view of “America”, since teams from Canada and the Caribbean are part of the mix, which makes this kind of like an age-group version of USA vs The World. Franklin Field gets loud for any close race, but the place goes completely bananas for the boys’ 4 x 400 (5:30pm ET). 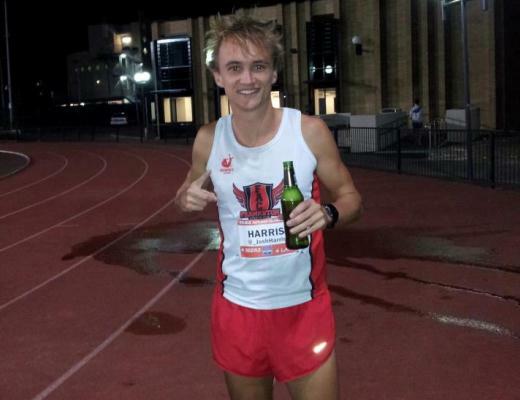 The pro races at the Drake Relays are truly first-class, the very best you’ll see in the USA outside of a national championship or Diamond League meet. There will be five of them today—men’s mile and shuttle hurdles and women’s 400, 400 hurdles and 100 hurdles—and last night’s action included Kirani James breaking Michael Johnson’s meet record. And I don’t think I need to tell you that “he broke Michael Johnson’s meet record” isn’t a phrase that gets regular use. And if somehow you need even more, the London Marathon will be run early tomorrow morning. Kevin Sully has a preview of it, one of the deepest fields ever assembled for any race, anywhere. You can see it live from 4:00am ET at Universal Sports website, or wait until 9:00am ET when it will air on Universal Sports TV.